Published: Apr 13, 2011 to ? Nanase Sakashita is good at playing the role of Model Student but that doesn't stop her from taking an interest in Hana-kun, the schools delinquent. Hana-kun accidentally drops a small box while sneaking around on the school grounds. When Nanase tries to return the box, Hana-kun tells her to keep it for its already too late to give it to the person he likes, who is this person? Before we begin, let me ask you this. How many shoujo manga have you read where the heroine is terribly clumsy, isn't smart, doesn't have friends, and the dark-haired boy is the one she falls for in the end, the boy is the most handsome and/or popular, a girl or girls plays dirty against the heroine, coincidental encounters, etcetera? Oh, don't forget the (ugh) "I'll protect you," saying. Those are only some of the overused and cringe worthy, shoujo manga cliches. Well, this manga is -none- of those things. In fact, it has a good story, the art's unique and above average, the characters are great, and it's funny to boot. To top it off, it's really cute in a heartwarming way. No shallow, forced tricks to be found here. 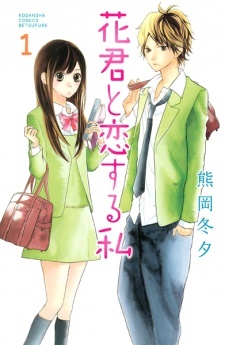 Hana-kun to Koisuru Watashi is a breath of fresh air of sorts. How so, you ask? At first, you see the boy introduced as a "delinquent." Yes, I know that's been used a lot, but hear me out. So the titular Hana is misunderstood, however. He isn't just the typical tough guy with a rarely shown soft side, he's a bit on the quiet side and because of the way others perceive him, he's mistaken to be an unreasonable troublemaker. Nanase, the heroine, didn't exactly see him in a good light. She was a bit wary of him, but, over time and after just a few initial misunderstandings (which are resolved pretty quickly), she learns that he's kind, a good person, and that he's caring. However, she learns that he likes someone, and here's another cliche avoided. The person in question isn't the popular or pretty girl. If I went past here it, there would be spoilers, and you don't really need a story summary or synopsis for reviews. At first, I didn't like this manga that much. Yet after re-reading 1-2 times, I understood things and they all added up into a great manga. Once certain things happen, it was the start of this series gradually moving up to my heart. It literally knocked out all my other favorites. There's something going on when it knocks down my favorite seinen series of several years, and that I keep re-reading over and over when it's still ongoing. I had to re-read Hana-kun to Koisuru Watashi multiple times -just- to find most of the "shoujo cliches" that actually are used. I must say, such cliches are quite scarce with this one. An example would be the girl has no umbrella scenario. Yes, they share an umbrella, but there is absolutely no romance on Hana's part, and Nanase doesn't start blushing like crazy. They spend a normal afterschool time as friends at a ramen place Hana frequents. Very slice of life like and normal, but still sweet in a moderate way. Another factor to mention is that "appearances" are barely brought up, like the other hundreds of shoujo manga out there. I didn't really notice the art at first, but that's how I'm usually like starting most manga. I don't pay a lot of attention to how good or bad art is unless it's particularly either of the two. For this manga, it's all right at first. I didn't notice that it's not exactly the best with the starting chapters, but the art -does- notably change. The beginning art is still decent enough to keep going, so even if it doesn't impress you at first, remember that it notably improves! I purposely compared the current and starting art, and you can visually see differences. Overall, I like and enjoy the art, even if it's not the best, it's still enjoyable. Nanase's eyes aren't drawn too huge (even if they're on the big side anyway; that's a shoujo manga element), and the art style isn't the kind that's overused to death. The style's really one of a kind. I've actually tried out half a thousand or so shoujo manga that aren't even listed in my manga list, and let me tell you something. There are times where different mangaka from different time periods "somehow" end up with art styles that are much too similar. Heck, more than usual, it looks downright bad and displeasing, even with some new shoujo manga. You won't have to worry about that with this. There are a few minor inconsistencies if you look carefully, but it doesn't affect your reading. Oh, and I shouldn't forget to mention that even from the beginning, character facial expressions are hilarious during funny moments. During such times, the way faces are drawn are very expressive and comical. I enjoy how well that's done. The art style used in Hana-kun to Koisuru Watashi is the opposite of boring with this added factor. It makes the manga real funny and something to like. Ah, yes, our two main characters are really what make this series so great. You have Sakashita Nanase, who isn't your typical airhead and isn't treated like a loser like so many other shoujo manga. She's diligent, doesn't blush super duper easily, she's pretty, cute, kind, and a bit on the innocent side. Nanase's caring and considerate, but isn't afraid to call herself out whenever she thinks she's being selfish or acting out of place. She's also the class representative, and she's smart. One thing I like a lot about her is that she isn't the typical girl who blushes constantly EVERY time she's around the boy she likes, or avoids him (which causes typical "problems" in other shoujo manga). She casually talks to Hana in the cafeteria when they pass by each other, all the while keeping the fact that she likes him in the back her head. She's not overly shy, and she's a genuinely good-natured girl, who has flaws she sets to improve upon over time. Of course, we can't forget Daikou Hana. From a misleading appearance and attitude that he gives off to others, he's literally seen as bad-natured to nearly everyone else. Nanase thought badly of him, too. Through her, we find out that that he picks fights with people for understandable reason (even if he thinks of violence a bit too quickly to solve situations, he doesn't get into fights often). When he starts falling for Nanase, we begin to see his reservedness, shyness, and kindness. Also how he's careful around her, and just how much he treasures her after a certain point. He's not your typical pretty boy, nor is he the typical popular cliche boy. He's adorable in both actions and appearance, and he's a caring person. Hana also has a slight shy side, and he's a sweet guy. Oh, and of course! The side characters are memorable, and they're interesting. These two do very cute things. Innocent, sickeningly cute things, but in a good and heartwarming way of sorts. It kind of pierces you through the heart with fluffiness. Examples would be (watch out for semi-spoilers here!) when the two become a couple, and Hana steals a quick kiss from Nanase, and he flees (it's an actual "sound effect" from the manga). Nanase is standing there, and he does a side kiss from behind, fleeing, and it becomes a comical moment. There's a part where she mentions that they make faces at each other when they have nothing to say, Hana's kind look at her when they're together, a ton of things. I'm quite surprised that I haven't died reading this shoujo manga. It's too sweet for anyone's heart. If you haven't noticed already, I very much enjoy this series. It utilizes very few cliches, the main two are great characters, the story isn't overused, and implements its own ideas. Don't forget that it'll also make you laugh. In all honesty, I feel like everyone should give this a try. It's very sweet and adorable. Re-reading this so many gosh darn times is a good thing. Every time I do so, I am never disappointed. I will warn you, though. It probably or might seem like nothing too special at first, but once you've gotten past a certain point, and whether you re-read it or not, you will enjoy it as well. I seriously hope that this underrated manga gets noticed someday, as it is well-received by fans from the manga site I use, but not elsewhere. I daresay that it's a rare gem hidden in the rough. I really do hope that you'll enjoy it, too! Before I begin, I would like to apologise for any mistakes that may occur due to the fact that English is not my native language. Nonetheless, I could not fight the need to write this review. 'Hana-kun to Koisuru Watashi' was a surprise. Shoujo mangas are my guilty pleasure and most of the time when I feel like reading one, I am not expecting much form it. With this manga, I once again came to the conclusion that finding something precious when you are not looking for it is great pleasure. 'Hana-kun to Koisuru Watashi' is gentle, bittersweet story with no breathtaking plot twists but still giving hunger for more. I recommand this mostly to those, who are looking for something authentic and emotional with a pinch of comedy. If you are fan of slice of life this story is total must. At first, the story seems like just an ordinary one- about two students who barely know each other but starts to get to know one another after an incident. But in this manga, it's time to unfold the untold story of a class rep. The one who's always a side character and has an unrequited love. I find the development of the story interesting and it's not exaggerated like other manga. It does have similarities with the others but it has its own unique charm. It's a bit fast paced but it made sure to highlight the points and important scenes. It's almost like reality but not a complicated one.What I also like about it is that the thoughts of the characters are well conveyed whether in words or actions. First, Nanase - she's smart and studies well, the typical class rep. I'm sure you've seen characters who studies hard and so they have given up on love (I also like those kind of characters though) but she's different. She isn't insensitive and she knows how to express it. I like how honest she is and open-minded. She knows how to cry of course but with good reasons, not just random. Then, there's Hana-kun- he may be called a "delinquent" but not like those tough looking guys you see in shounen (those muscle men XD). He's actually pretty normal though he may do some reckless things. And he's in fact gentle though he doesn't know how to express it at times. I really like guys who change for the better for the person they love.As I've said,they are innocent and I find it funny because even Hana handles it in a clumsy way. The rest of the characters are all nice be it guys or girls. You won't only love the MCs but also the supporting characters. There are only few slice of life manga/anime that had affected my mood. I'm not easily moved so I don't cry. After reading a certain sad chapter, it made me feel depressed even after sleeping. I'm amazed haha It's not that sad but since I have supported and loved the couple it feels like my heart can't take it anymore seeing you sad. Poor Nanase :( So obviouly, I enjoyed it. It doesn't need to exaggerate things to give a good story. Showing an innocent, pure and funny romance is enough for you to enjoy. It's not the most original plot I ever read, but its a story really easy to relate to. What I usually don't like in shoujo manga is how they make up situation that are totally unbelievable just for the sake of having the main guy rescue the girl, or just to let the heroine have some sort of epiphany. Well, good thing is, it doesn't happen in this manga. I guess this is the manga strongest point, at least to me. The heroine is not your typical dumb chick, who dosn't have any friends, deep down is really cute, but no one knows it yet, except for the main guy. She is a totally normal girl, who takes school seriously, has a couple of friends, a weird guy who keeps confessing to her. What I like is how she over thinks (sometimes with the help of her friends) little things that regard hana, for example she has difficulties to ask him for his cell number, or she takes a ridiculous amount of time just to write him a text. I think every girl has gone through that more or less. The main guy is also a normal teenager, they say in the first chapters that he is a delinquent, but seems to me just a guy who does't like school very much and skips it a lot, but i mean, can we really blame him? I also feel like he's really growing and becoming more and more mature. I just wanna keep reading a chapter after another.. Well i guess that means i really enjoy it! Well, I thnk I have already said it all so I'll simply end this saying that if you are into shoujo that tell you the story of how two people fall in love, than this is a must! Waiting for your favorite manga to finally get its small screen debut can be tiresome, but when that moment comes, it's usually always worth the wait! Here are 11 manga series, filled with magnificent artwork and stories, that we hope will get their anime adaptations in the near future!